By Acne Scar Treatment Expert Dr. Philip Young. We took over 15 years to formulate our Five to Seven Step process that treats all varieties of Acne Scars and is finished in a couple of hours. Learn More About the Acne Scar Vitalizer Treatment Today! 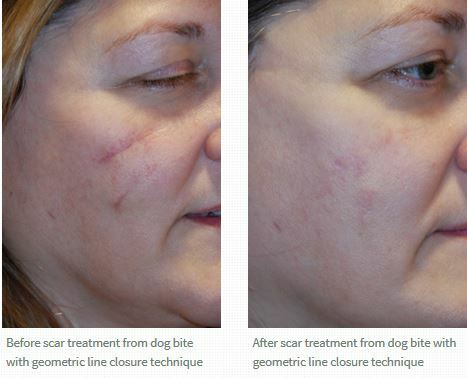 Above is a before and after photograph of a person who had a dog bite to the face that created a Linear Depressed Straight Line Scar. 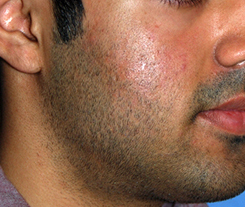 Although, this particular example is showing a dog bite scar, this type of scar can be found in Acne Scarring. The scars may not be linear but a common thread is the depressed nature of the acne scar that can apply to these principles. We improved this scar through a geometric line patterned closure. This allowed us to improve the depression and the linear appearance of the scar to camouflage it better. The human is more likely to see any scar that is straight and longer than 0.7cm or 7mm. So if there is a straight line to the scar that is that length or longer, it can be improved by making the scar take on a random pattern. This is why we employ the geometric line closure to help with improve the scars that are straight, linear, and depressed. In this before and after, the patient also had a further depression when she smiled that made the scar look even worse. We improved that situation through a layered closure to put the tissues and planes back the way they were. When should we choose the Acne Scar Vitalizer versus the Geometric Line Closure and other traditional methods? In some situations, using a geometric line excision and closure is the best choice. When do we decide to do this as opposed to the Acne Scar Vitalizer? If all you have is just a scar that can be connected by a pattern or is a straight line scar, you could benefit from a geometric line closure. In this situation it is easy to take care of this collection of scars that can fit into a nice pattern that you can cut out and then subsequently laser. However if your whole face is involved in the process it does not make sense to cut out every scar that can fit into a pattern. There is just not enough skin to be able to incorporate all these excisions in this situation. 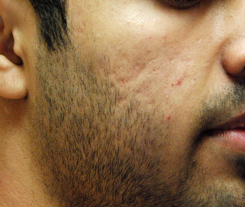 More specifically with acne scars there are many situations where you have these linear scars and depressed scars everywhere. It is in this situation that we like to do the Acne Scar Vitalizer Treatment that can be handled in just one treatment.